A WHITE flash in a sea of green was the first sign of a man in desperate peril. Looking through night-vision goggles on a routine training flight, Australian Army Officer Cadet Ingrid Dylan and Captain Gary Hamilton hovered closer in their two-seater Kiowa helicopter. A car had burst into flames after slamming into a tree on a remote stretch of Pierces Creek Rd near Cooyar, north of Toowoomba, about 6.45pm on Thursday. Inside, an 85-year-old man was hanging from the passenger window, trying desperately to escape the fire. "It was definitely more instinct when you see someone who needs assistance; you just jump in and do the best you can," Officer Cadet Dylan, 29, said. "I approached it with a lot of caution not having any idea of what I would find. "Once I noticed (he) needed a great deal of assistance, that's all I could do from that point." Without fear or hesitation, she quickly landed nearby to try and save the man's life. "He was conscious and as soon as I dragged him free across the road and far enough away from the fire, I was able to communicate with him quite freely," she said. "Although he was in considerable pain, he was coherent and responsive. "I was asking him his name and ... whether there were more passengers in the vehicle with him. "I just tried to get as many details as possible to pass onto my instructor." Tragically, the man died in the Royal Brisbane Hospital early yesterday morning after being airlifted from the scene by RACQ LifeFlight. Captain Gary Hamilton said Officer Cadet Dylan's actions were nothing short of heroic. "As soon as we landed I asked her about her experience with first-aid," he said, adding she was more experienced in that regard. "She accepted without any hesitation. When she came back and explained the situation, it was a lot more serious than we thought or were hoping. Radioing back to emergency services, Capt. Hamilton was soon joined by Captain Warren Wilton and Lieutenant Michael Tenkate. The four remained on scene until paramedics arrived, guided to the location by the air crew. 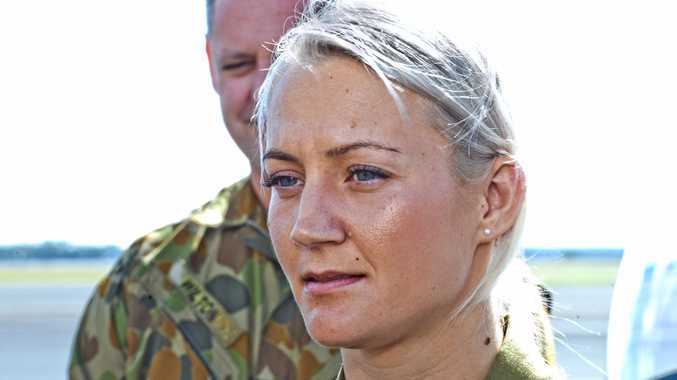 Lt Tenkate said the rescue efforts were a credit to the Australian Army. "I was really proud of (Ingrid) who, with just no thought of self-preservation, ran into that," he said. "The training just sets you up for these types of situations." Capt. Wilton said the thoughts of the first-responders were with the man's family. "On behalf of the group, I'd like to express our deepest sympathies to the gentleman's family," he said. Officer Cadet Dylan is humble about her actions and downplayed her role in the dramatic rescue. Now turning her focus back to her final training mission ahead of her graduation next week, she said she only did what any of her fellow students would have.